Female watch OOZOOCollection OOZOO timepieces Summer 2018 Product code W410793Case materialMeta.. Female watch OOZOO Collection Timepieces Summer 2018Product code W410794Case materialMetalCase .. Female watch OOZOOCollection OOZOO Timepieces Summer 2018Product code W4107134Case materialMetalCase.. Female watch OOZOOCollection OOZOO Timepieces summer 2018 Case materialMetalCase colorSilverCas.. Female watch OOZOOCollection OOZOO Timepieces summer 2018 Case materialMetalCase colorRoseCase .. Male watch OOZOOCollection OOZOO Timepieces Summer 2018Product code W410735Case materialMetalCase co.. 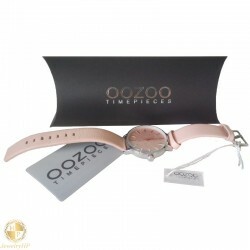 Male watch OOZOO Collection OOZOO Timepieces Summer 2018 Product code W410734Case material.. Male watch OOZOO Collection OOZOO Timepieces Summer 2018Product code W410733Case materialMetalC.. Male watch OOZOO Collection OOZOO Timepieces Summer 2018 Product code W410707Case material..